Drumbeats's (ex Salperton) layout has the main cockpit, saloon, formal dining area and pilothouse on the same level. This space plan is quite unique on a sailing yacht. The yacht features visibility and straight sight lines which give a feeling of space and light as well as direct but sheltered visual contact with the sea in all areas. Each of her five magnificent guest staterooms has generous natural light. Guest accommodation includes the owner’s suite, three double guest cabins and a gymnasium which has two pull out berths and a bunk. Drumbeat has six crew cabins, all ensuite, giving comfortable accommodation for her crew. ‘Drumbeat’ (ex Salperton) was designed by the renowned Dubois Naval Architects and at 174' ‘Drumbeat’ is one of the largest built in New Zealand by Alloy Yachts. Drumbeat is a high-performance luxury ketch, which although able to provide exhilarating sailing speeds of over 15 knots also provides great sailing comfort, sea worthiness and space. 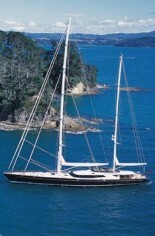 Sailing Yacht DRUMBEAT has completed a major interior refit in 2005. 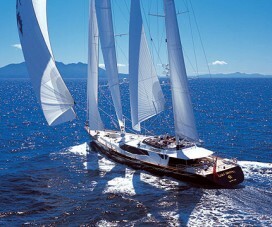 Her interior has been redesigned to reflect the simplicity and beauty of the lines of this head turning sailing yacht. Her colors, tones, materials and furniture are designed for relaxed comfort. 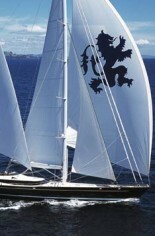 The yacht’s design places a premium on good crew accommodations, which in turn attracts good crew. Consequently, the general arrangement had to accommodate six crew cabins all with en-suite facilities and able to sleep two people even though the yacht would generally carry a compliment of nine. The crew mess also had to be spacious and inviting. The owner’s suite is very spacious, occupying the full beam of the yacht towards the stern and there would be four double guest cabins, all with en-suite bathrooms. These requirements pointed to a very large yacht, requiring high levels of experience and skill in the design and construction. 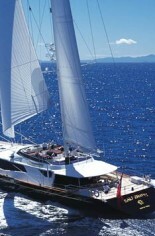 She is available for charter in the Mediterranean and Caribbean Seas as well as more exotic locations around the globe. Sailing yacht Drumbeat has the following amenities and extras: Communications equipment: GSM, Mini M & Iridium Cellular telephones (Europe & USA), Water sports equipment: Castoldi 21 foot RIB - water jet - with weather protection Avon 4.5 metre RIB with 50 hp outboard, Yamaha wave runner, 2 x wind surfers, 4 x dive and snorkelling gear, 4 x mountain bikes, 3 x sea canoes, Audiovisual Equipment: Each cabin has individual CD/radios and DVD players. Other equipment: Multi gym, Exercise bike and rowing machine.